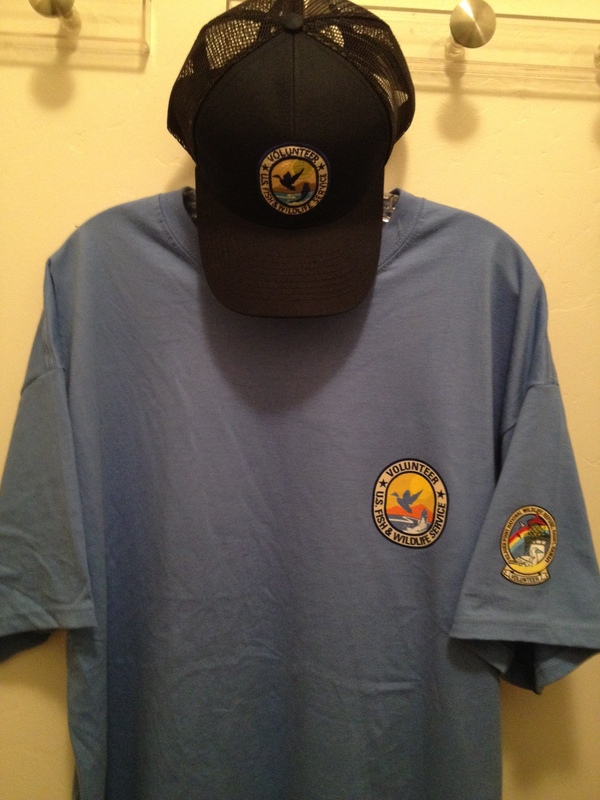 Tuesday marked my first day on the ‘job’, as a volunteer at the Kilauea Point National Wildlife Refuge (KPNWR). I had a brief orientation with Jennifer Waipa who’s the park ranger responsible for the volunteers. Then, for the afternoon shift from 1 to 4pm, I shadowed a long-time, very experienced and equally entertaining volunteer named Bruce Parsil. I felt like a new kid on the first day at school, and the afternoon was a great experience: perfect weather, with sufficient wind for the birds to be constantly playing and drifting all around us, and a ton of fascinating information to absorb from Bruce. The main residents at this time of year are the frigate birds, shearwaters, red-footed boobies, and tropic birds (both white-tailed and red-tailed). The Laysan albatross have already bred, the youngsters have fledged, and all have returned to sea. ‘Our’ frigates are female only. No breeding occurs here; they just seem to hang out and chill. Either they are non-breeding females, or they are stopping off on their way to or from their breeding grounds. So, sadly, not much chance of the glorious sight of a male frigate with his huge engorged red throat. There are two species of shearwater on the island, the Wedge-tailed Shearwater and the smaller Newell’s Shearwater. The ‘wedgies’ are not endangered, and breed in burrows around the bluff including close to pathways (so close that sometimes the chicks fall out and roll down the path). 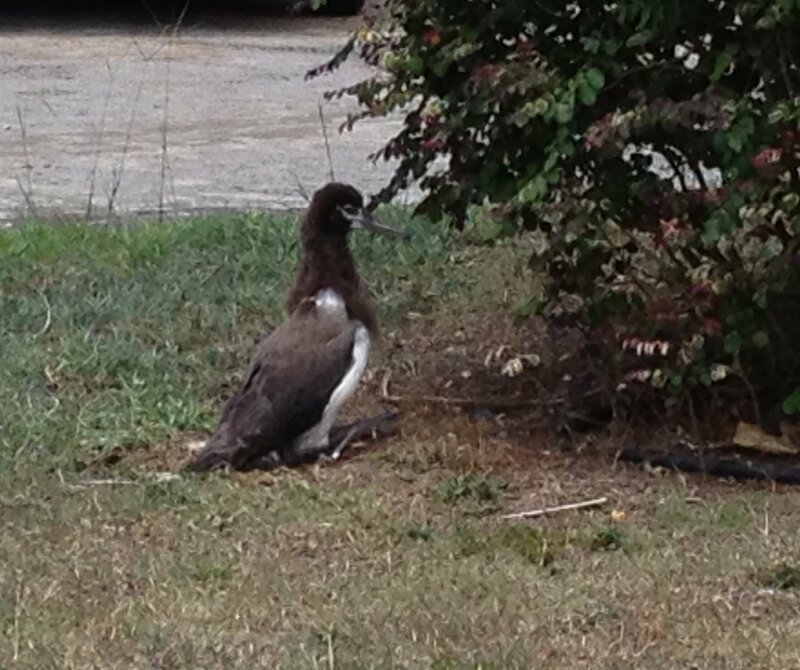 The Newell shearwaters, on the other hand, are endangered, and usually breed further inland…high in the mountains. However, a recent program seems to have been successful in establishing a number of Newells on refuge land. 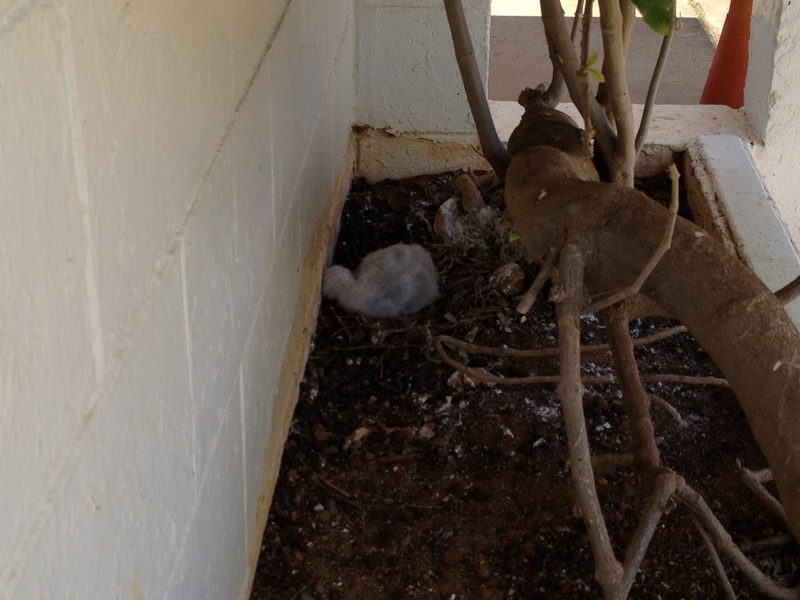 The shearwaters are now hatching. The first wedgie on the refuge hatched three weeks ago and, surprisingly, is situated in one of the most public, exposed areas, immediately outside the interpretation center beside the lighthouse. The parents return year after year to nest in that spot, so evidently the human activity doesn’t bother them too much. The chick is currently a cute pale gray/white fluffball which attracted a great deal of visitor interest and gave me several opportunities to regurgitate Bruce’s words of wisdom. There is a hybrid tropic bird. The traditional white-tails have a pale beak, and the red-tails have a red beak…then there’s the hybrid that has a white tail and a red beak! I know, I’ve seen them! I’ve omitted any details about the red-footed boobies…they will probably have a dedicated post in the future. There were some other entertaining sights as well as the birds. We spotted a large number of spinner dolphins, who often hang out in the bay to the west of the Point until mid-afternoon, and we had just one sighting of a green turtle. 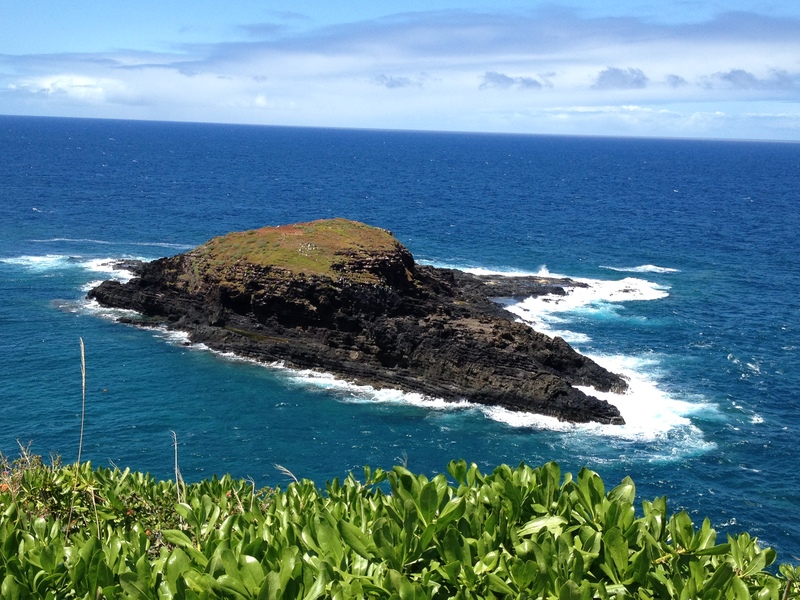 No monk seals that afternoon, but I’ve seen one near the Point in the past. 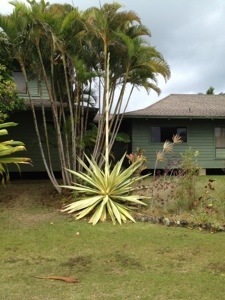 In a neighboring yard is a plant with a flower stem that resembles an enormous asparagus stalk. This is an agave. A neighbor tells me he’s lived here over 10 years and this is the first time he’s seen it flower. Agave stalks are used to make didgeridoos…perhaps that’s why one rarely sees anyone wandering down the street with a didgeridoo tucked under their arm! Apparently, once an agave has flowered, the entire plant will die. However, its seedlings form the next generation…I wonder if I’ll still be here to see its offspring flower too. 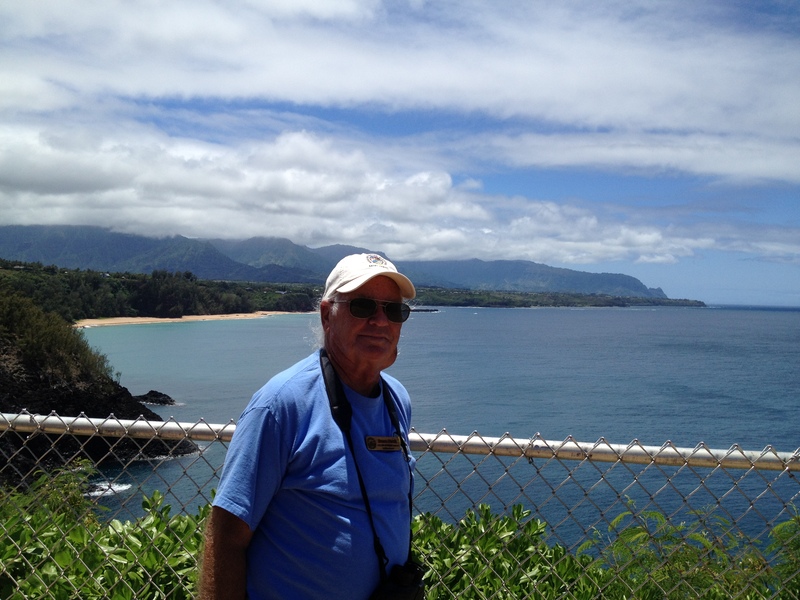 The albatross return each year to breed on Kauai. Since they are exceedingly ungainly on land (hence their nickname of gooney birds) and require an extensive runway for landings and take-offs, a few roads in our area close to the bluff are prime nesting sites. The adults return in November. Courtships, egg-laying, hatching, and chick-rearing follow. Eventually the parents leave the almost full grown chicks, and by mid-to-late July all the youngsters have fledged. All, it seems, except one this year. This one chick is evidently a late-bloomer, or just plain lazy, but I am delighted he hung around long enough for our arrival this week. I’ve had the pleasure of watching him grow during my previous visits in February and again in April, so it’s a treat to witness the final stage in this year’s cycle. As the chicks lose their baby fluff and gain their sleek adult plumage, each has its own highly amusing pattern of ‘hair’ loss! One of Steve’s fondest wishes for the past year has been to swim with Freya in the warm Hawaiian waters. We’ve often taken her to beaches on the Pacific coast of California…Fort Funston (aka Fort Fundog) just south of San Francisco; Half Moon Bay; Carmel…where Freya has romped in the surf but rarely swum, and never with Steve. This afternoon he had his wish! They swam together at Anini Beach, a 2-3 mile stretch of beach on the north shore, a 10 minute drive from the house, where it’s easy to find a peaceful patch away from more crowded beach parks. We almost had the place to ourselves, except for a very pleasant local chap who came for a swim with his 14-month-old Aussie Shepherd, Kobe. Kobe seemed more keen to play with Freya than to swim with his boss! Freya earned her rest this afternoon! After her lengthy swim, she dug a hole and flopped down to survey her new surroundings! Like so many before us, we fell in love with this island when we first visited in 2008, but at that time it never occurred to us that we could contemplate a permanent move here. Late in 2010 we started investigating where we wanted to be when we retired from our Silicon Valley careers. Plan A was to relocate to the Central Coast, midway between San Francisco and LA, which would be roughly a four-hour road trip for our Bay Area friends. 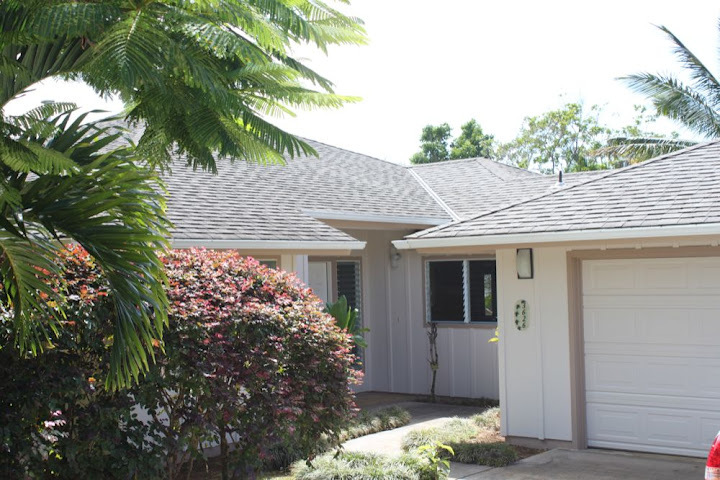 Kauai, we figured, isn’t much further…you just have to fly rather than drive…and so, Plan B was born. 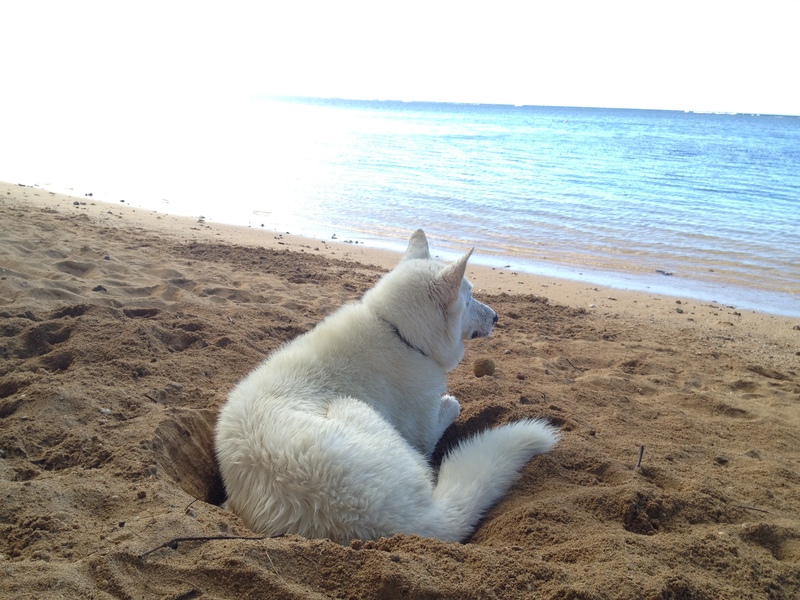 We bought a home in Princeville mid-2011, intending to use it for vacations for a couple of years (here’s a site I created for others who might visit in the interim), but the pull of the island was greater than expected, so we sped up the timeline, and made the move, with our white shepherd Freya, in August 2012. This blog is primarily a way of staying in touch with the many friends we’ve made around the world, and of sharing photos and experiences.